Roscosmos (via Twitter)A video screenshot showing the Soyuz MS-10 rocket launch failure on October 12. The crew – Nick Hague, a NASA astronaut, and Alexey Ovchinin, a Russian cosmonaut – had their space capsule ejected from the rocket and survived without injury. 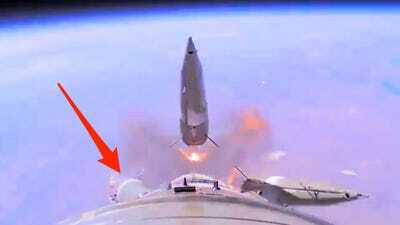 Roscosmos, Russia’s space agency, posted a video of the botched launch on Twitter on Thursday. Almost three weeks ago, on October 12, a Soyuz rocket carrying a NASA astronaut and a Russian cosmonaut failed mid-flight, 31 miles above Earth’s surface. The space capsule carrying the two men ripped away from the damaged rocket, then plunged back to Earth. “We knew that if we wanted to be successful, we needed to stay calm, and we needed to execute the procedures in front of us as smoothly and efficiently as we could,” Hague told The Associated Press. After investigating the incident, Russia’s space agency, Roscosmos, determined that one of the rocket’s boosters failed and stuck to the main rocket body instead of peeling off. That failure was filmed from a camera attached to the rocket, looking down its body. But the failure is worrisome, since Soyuz is the only human-rated spacecraft used to get people to and from the space station. It’s relied upon by NASA, Europe, Russia, and other partners.